Microspin Columns- centrifuge columns supplied with caps and plug. Each column contains 0.1 mL LigaTrap® Human IgM Purification Resin in PBS buffer with 0.05% sodium azide. 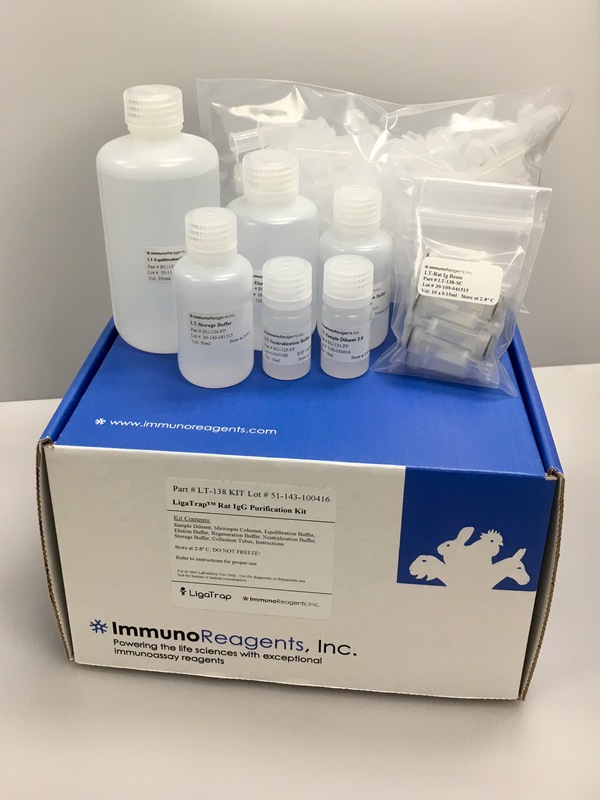 ImmunoReagents is now offering LigaTrap® purification resins and kits, engineered for antibody purification. LigaTrap® Technologies has developed a novel, patented, series of affinity ligands specific for the purification of monoclonal and polyclonal immunoglobulins from various species. In addition to species-specific ligands, advantages include the ability to elute antibodies at a higher pH (pH 4.0) than protein A and G (pH ≤ 3.0), thus reducing the potential for precipitation and inactivation of pH sensitive antibodies. LigaTrap® Human IgM Purification Resin is engineered to purify high quality human IgM antibodies from recombinant and monoclonal sources. Binding capacity for human IgM is >5mg/ml resin. The LigaTrap® Human IgM Purification Kit provides all the necessary reagents for fast, convenient micro-scale purification of human IgM in just 10 easy steps. Each kit contains 10 microspin columns prefilled with 0.1ml of LigaTrap® Human IgM Purification Resin, buffers, and collection tubes. Each spin column can be used, regenerated, and used up to 10 times with minimal loss in binding capacity. 1. In a separate tube (not supplied in kit) add 400µl of sample matrix (i.e. supernate or cell culture media) containing human IgM. 2. Add 100µl of LT Sample Diluent 2.0 to the sample. Mix briefly by vortexing. 3. Equilibrate resin by adding 400µl of LT Equilibration/Wash Buffer 2.0. Snap the bottom plug on the Microspin column. Save the plug, as it will be needed to stopper the column. Insert the Microspin column into a supplied 2.0 mL Collection Tube. Centrifuge between 2000-3000 x g for 1 minute. Empty the buffer from Collection Tube. Repeat with an additional 400µl equilibration. Insert the bottom plug into the Microspin column. 4. Transfer 400µl of prepared sample (Step # 2) to the equilibrated column. Place screw cap on snugly. Vortex briefly for 15 seconds. Continue to mix/shake the sample and resin continuously for 60 min. 5. Remove plug and insert the Microspin column into a Collection Tube. Centrifuge between 2000-3000 x g for 1 minute. Discard unbound material or retain for further evaluation. *IR-Tip: Collection Tubes used to collect washes can be reused. 7. Insert the washed Microspin column into a new, labeled Collection Tube. Add 400µl of LT Elution Buffer to the column. Vortex briefly for 15 seconds. Centrifuge between 2000-3000 x g for 1 minute. Place the Microspin column into a new, labeled Collection Tube. Repeat with second 400µl elution. *Note: The eluates contain the purified antibodies. Do not discard! 8. Pool eluates from Step 7 and add 80µl of LT Neutralization Buffer to the antibody. Attach the cap. Vortex briefly. The antibody will be near neutral pH. The antibody is ready for downstream applications. Note: There are no preservatives in the antibody. Use the antibody within one week or aliquot and store at -20º C or colder. Avoid multiple freeze thaws. 9. If the column will not be reused, it can be discarded. If column is to be reused, regenerate the column by adding 400µl of LT Regeneration Buffer. Vortex briefly for 15 seconds. Insert the Microspin column into a 2.0 mL Collection Tube and centrifuge between 2000-3000 x g for 1 minute. 10. To store resin add 500µl of LT Storage Buffer. Insert the Microspin column into a 2.0 mL Collection Tube. Centrifuge between 2000-3000 x g for 1 minute. Discard wash. Repeat with an additional two washes for a total of three washes. (3x400µl) Insert the bottom plug into the Microspin column, add 400µl of fresh LT Storage Buffer and store at 2-8º C.
LigaTrap® purification kits and resins are convenient and easy-to-use. Simply add the sample to the resin, mix and centrifuge. Not only are LigaTrap® purification protocols simple to follow, but also allow for fast and easy recovery of purified antibodies for screening in your end-use assay. Multiple samples can be processed at the same time, resulting in rapid screening for antibody production. LigaTrap® spin columns only require a pipette and centrifuge, no specialized equipment needed. Each spin column is capable of up to 10 purifications, and each kit has the ability to perform over 100 purifications, making LigaTrap® a cost-effective method for antibody purification.